On Wednesday 3rd October children from across Highclare School attended an assembly at Highclare Senior School to present a cheque to the Buddy Bag Foundation following a year of fundraising. 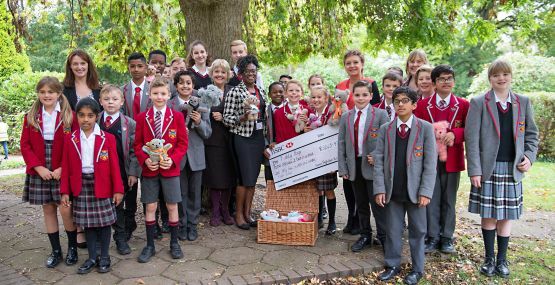 Mrs Moore and the children presented a Cheque for £3245.97 and knitted teddy bears to Angela Henry and Karen Williams from the foundation. Everyone enjoyed a special lunch with our guests from Buddy Bags before returning to classes for the afternoon. Unfortunately Acorns Children’s Hospice were unable to attend but will receive a cheque in separate assembly for £3245.97. Thank you to all parents, pupils, staff and family member for their continued support!